The Roaring 20's hit Okmulgee much like it did in the rest of the country. Radio programs were popular, as television hadn't been invented yet. People sat around and listened to popular shows or music from the great Jazz artists such as Louis Armstrong and Duke Ellington. 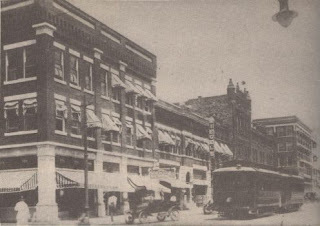 Towards the middle of the 20's, vaudeville theaters were slowly being replaced by movie theaters. It was a time of great prosperity. Many of Okmulgee's great architectural buildings were erected at this time, and most remain standing to this day. The oil business had grown substantially as the fields continued to produce and new oil sands were discovered. Okmulgee was crowded with oil men and geologists. Townspeople could always spot the geologists by their high laced boots. Airplanes were being used for aerial reconnaissance to speed up the process of hunting for oil. Billy Burke and Fred Roberts were partners in the first airplane in Okmulgee; it was stored on the old Morris highway. Okmulgee's days as a great, booming city were numbered. The great stock market crash of 1929 marked a turning point in Okmulgee's history. Many of the wealthy and powerful were reduced to poverty, and Okmulgee entered into a period of decline that lasted many years afterward.